Turn News Sentiment Into Actionable Insights. StockSnips real-time news sentiment analysis provides a clear signal into the movement of price in the market. By sifting through and summarizing millions of SEC filings and news publications, StockSnips delivers concise and unbiased financial sentiment to you. Use StockSnips to monitor and understand market movements. StockSnips uses news sentiment to describe stock behavior and tell you what the world is saying and doing with the stocks you care about. Our advanced algorithm identifies and summarizes relevant news to hone your investment decisions. Over time, sentiment changes in the news — positive and negative — strongly correlate with price. Typically, positive sentiment changes pushes price up while negative sentiment drives price down. Stocksnips reduces cost and time to navigate through relevant news, identify sentiment and aggregate findings for a company or sector. Watch as the sentiment for AAPL moves up and down ahead of price. Our suite of products are geared towards those looking to upgrade to a new level of investment strategy. 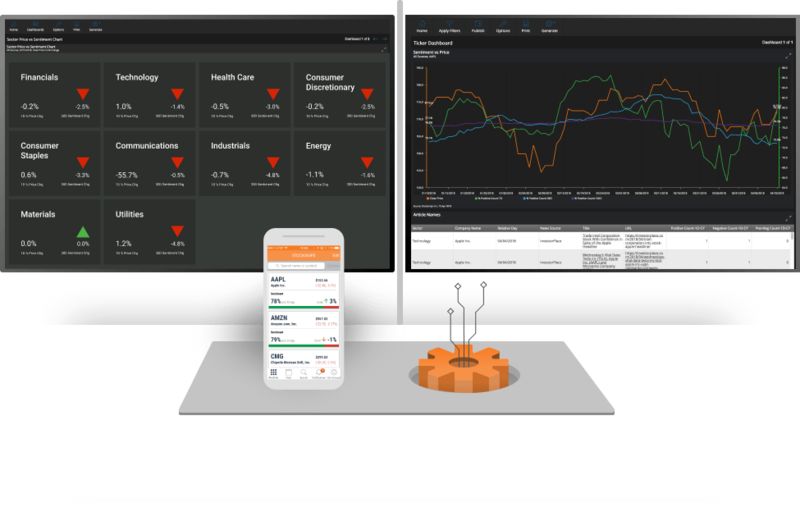 Integrate the StockSnips real-time sentiment analysis API into your existing tools and applications to enhance your market awareness and provide new potential for informed investment strategies and decision making. By combining Natural Language Parsing, Artificial Intelligence, and Advanced Machine Learning models — we offer institutions and individuals insights into their investments.